Apart from Sullivan’s odd seeming obsession with the details behind the birth of Palin’s youngest child which bordered on “Trig Trutherism” those reading his broader comments on Palin have seen he has been one of the few who have not dismissed her chances-both for the nomination and the presidency. This is not out of any overt love for Sarah but “from fear for America”-however his strange mix of rationality and weirdness does not detract from the insightful analysis he presents of how she might actually do in a campaign. The enemy of my enemy is still my enemy but in this case he hits on the truth in some points. Took an incognito tour of our beautiful national monuments tonight. 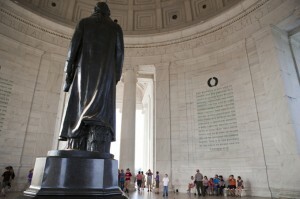 We met some great everyday citizens who were also “taking it all in” in honor of the greatest nation on earth. One couple we met traveled from Michigan to celebrate their 10th wedding anniversary in our nation’s capital, and they expressed how thankful they were to live in this land of great opportunity. We were also privilege tonight to get to thank a member of the greatest generation for his service in WWII. 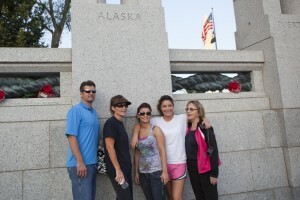 This fine patriot was surrounded by his large extended family that had pooled together to send their patriarch from Oklahoma to DC this Memorial Day weekend to see the breathtaking WWII memorial built to honor that generation’s tremendous sacrifice. 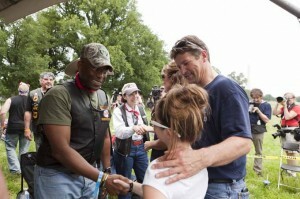 Meeting him and his caring family made my heart soar with pride for the honor so many show our military vets. Tonight, as the sun set and we gathered to read the eternal words of President Lincoln at the majestic memorial in his honor, we were shown more reasons why Americans can feel great pride in our exceptional nation. The Lincoln Memorial reminds us that ours is to be a government “of the people, by the people and for the people” and it’s with gratefulness for past generations that we can commit ourselves to living out the promises and values etched on those memorial walls. And that’s what this tour is all about. 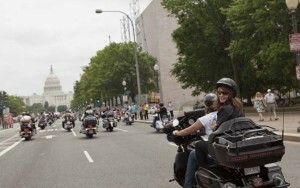 There’s no better way to see D.C. than on the back of a Harley! My family may be used to snowmachines more so than motorcycles (though you couldn’t tell it with Todd driving a hog today with Piper on the back and with Bristol riding on the back of another bike). But whether you’re riding the open road or the frozen tundra, you’re celebrating a free spirit. What could be more American than that? 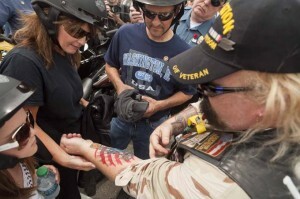 Today’s Rolling Thunder rally in DC is all about freedom. And it’s about duty and loyalty and service. The message heard loud and clear through the roar of tens of thousands of bike engines declared, “We will never forget our heroes left behind!” Truly, our POWs and MIAs honored today are America’s real heroes. In addition to drawing special attention to POWs and MIAs, Rolling Thunders works to help all veterans, active duty service men and women, and military families in so many ways. 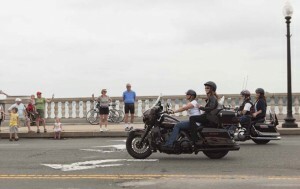 Riding with these patriots today reinforced that we must do all we can to remind all Americans that we owe our freedom to our vets and to those missing and to those who made the ultimate sacrifice to make this the greatest country on earth. They deserve our debt of gratitude. It’s not the politician or the reporter who makes us free; it is the veteran. 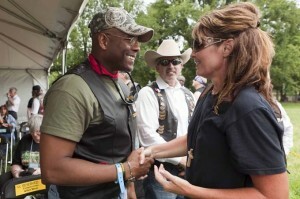 One man who clearly understands this is Rep. Allen West, who was there today to honor our military. I really appreciated meeting him. Thank you for spending your day with the troops, Lt. Colonel West! Meeting with Blue Star and Gold Star mothers this afternoon puts much into perspective. These beautiful families sacrifice so much for our freedom. This is what Memorial Day weekend is all about. Many of us this weekend are firing up the grill and enjoying time with our loved ones. Remember that we’re able to do that because someone else’s loved one is willing to lay it all on the line to defend our freedom. Someone is willing to re-deploy again and again far from home. Someone is willing to endure the blistering heat of Iraq’s deserts or the brutal cold of Afghanistan’s mountains. Someone is willing to put his or her own life on hold to make sure we’re safe. We never hear them complain, do we? And we never hear their families complain either. That’s what duty and service means. 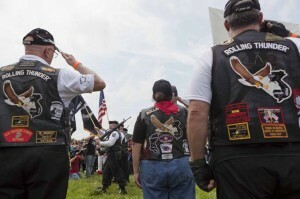 And Rolling Thunder’s commitment to them is what loyalty means. 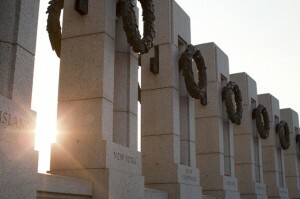 Let’s roll on to honor our vets, to secure our blessings of liberty, and to fundamentally restore our proud America! “Palin-flamethrower, Geoffrey Dunn of the Huffington Post released The Lies of Sarah Palin: The Untold Story Behind Her Relentless Quest for Power May 10th and Frank Bailey, former Aide to Palin, teamed up with Palin-critic Jeanne Devon to release Blind Allegiance to Sarah Palin: A Memoir of Our Tumultuous Years on May 24th. Ardent opponents of Sarah Palin have been highly-anticipating these books which promised to tear down Palin’s public image for the long-term. The lamestream media is trying to concoct some sort of “feud” between Sarah and Bristol over Bristol’s “relationship” with her soon to be co-star Kyle Massey.The not stated, but implied hint of racism, pervades this whole sorry episode. “Mounting evidence that Sarah Palin may have bought a $1.7million home in Arizona has sparked speculation she will run for president next year. But it seems the real reason for the move could be more personal – to keep tabs on her daughter, Bristol. Stacy McCain gets to the real truth-which is why the investigative site “The Other McCain” is so hugely popular and influential-and blows the lies out of the water in his comments below the photo of the Massey family. 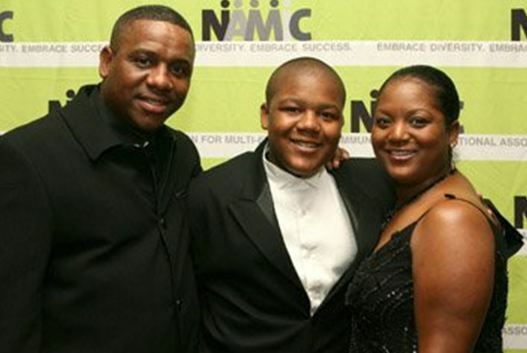 Angel Massey (right) and her husband Michael Massey (left) with their son, Kyle Massey. Isn’t that nice? And wouldn’t you think the rest of the media would be rushing to report this neat human-interest angle about the Palin family? “As we have often stated in these columns, Sarah Palin is consistently underrated by Republicans, Democrats and media alike as a possible contender for the White House. Now with the Republican field imploding in the past few weeks, suddenly Palin is back in the limelight again. Truth is she has never given up her ambition. She looks at this Republican field and sees huge weaknesses, from Mitt Romney’s flip flops to Newt Gingrich’s womanizing to Tim Pawlenty’s lack of charisma. Sure she ceded the stage to Donald Trump’s ill-fated run, but it was always clear that Trump would eventually slink away once he had milked it enough. Now Sarah comes swanning back into the limelight and no one has a hold on the Tea Party and Conservative wing like she has. She has now moved to Arizona, a clever move in the circumstances which places her in the heart of the Republican belt. She is running all right and has the backing and support others can only dream of. She would easily win Iowa with its massive evangelical base if it was voted on tomorrow. With that under her belt she automatically becomes favorite in new Hampshire. 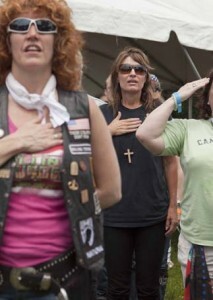 If she could knock Romney off there the path to the nomination is clear. We all thought Hillary would be the first major woman candidate for president nominated by her party. We have to adjust out bifocals folks, here comes Sarah and she is running hard.